When the summer days are hot and steamy try this cool cucumber soup for a delicious, creamy lunch or light dinner! 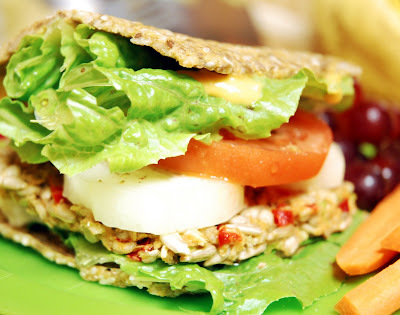 Enjoy with raw crackers and a fresh salad or all by its fresh, creamy self! Everyone loves a summer celebration and the focus is usually on the food. Here are some fantastic recipes to help you stay raw while you party! Place celery, onion, bell peppers, salt, oregano, sunflower seeds and flax seeds in a bowl, adding water last. Mix well. Form four balls and flatten into burger patties. Place on mesh dehydrator tray and dehydrate at 105 degrees for 7 hours turning burgers over half way through. Mix ground and whole flax seeds, salt, garlic, onion, and water. Add sunflower and sesame seeds and mix well. Use the back of a spoon to spread batter evenly on one teflex sheet on dehydrator tray. Dry at 105 degrees for 4 hours. Flip onto mesh sheet and finish dehydrating for another 4 hours or until desired firmness. To serve, dress your sunflower burger with lettuce, tomato, cucumber, sea salt & pepper, raw mustard and catsup. 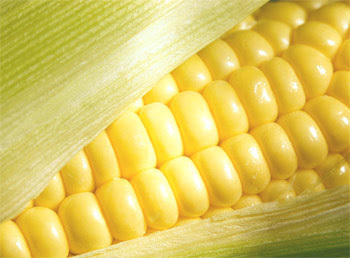 Take the husks off fresh corn cobs and wipe off the corn silk. Salt and pepper if you prefer. Bite into a juicy taste treat! Make a presentation of your fruit by threading them onto bamboo skewars and poking them into a pineapple or flower vase. 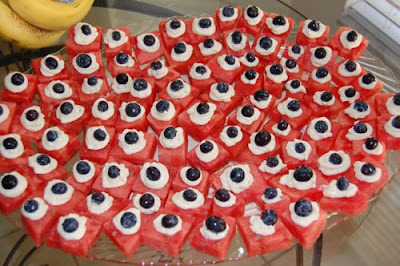 Use star fruit, blueberries and star-shaped cookie cutters on watermelon slices to get a patriotic look. 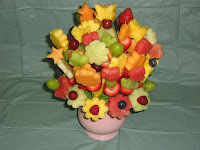 Or cut flower shapes for a summer bouquet of fruit. 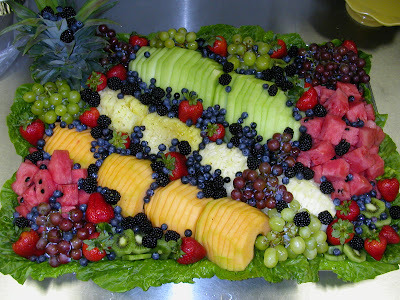 Get creative and take your fruit from simple to spectacular! In a large mixing bowl, combine all of the salad ingredients and toss to mix thoroughly. 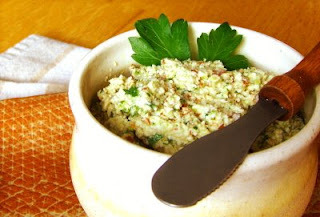 In a high-speed blender combine the dressing ingredietns and blend until smooth. Pour the dressing over the salad, mix well, and serve. Blend crust ingredients in a food processor and form into a pie pan. In a food processor, blend 2 apples with the dates until smooth. Pour into a bowl and set aside. In food processor, pulse chop 4 apples into tiny pieces. Remove from food processor and place in bowl with the dates. (You can slice the apples instead if you like a more traditional looking pie). To the date mixture, add the cinnamon, lemon, and currants and mix well. Pour filling into pie curst and let stand for at least an hour. Place watermelon cubes on a serving platter. Put cashews, agave, and vanilla in food processor and process. Add water slowly, little by little to achieve a smooth frosting-like consistency. Place in a zip-lock bag and cut a small section off the bottom corner. Use this as your frosting instrument. Squeeze frosting on each watermelon, then top with a blueberry! You can also include little flags on each one for decoration. Place about 1 ½ – 2 C water in high speed blender. Add the rest of the ingredients a couple at a time, mixing between. Blend until smooth, green and luscious. Pour into a beautiful glass and enjoy the liquid energy coursing through your veins! Green smoothies are most nutritious when eaten immediately, but if you have some left, refrigerate and have it for lunch. Note: Try your own variations. Use whatever fruits you like and add a handful of kale and/or spinach. You’ll come up with some delicious favorites and become addicted to how great they make you feel! Crust: In a food processor grind almonds until fine. Add dates and blend until smooth. Remove and pat into a pie plate. Filling: In food processor combine 4 C blueberries, 2 bananas and 1 ½ TB honey. Blend until smooth. Remove from processor and stir in 2 C whole blueberries. Pour into crust. Refrigerate at least 3 hours so the filling can firm up. Note: I love this even better without the crust! Just mix up the filling, pour into a bowl and chill until firm for Blueberry Pudding. So Simple! A clever friend of mine made the filling with the berries still frozen and it was a yummy blueberry ice-cream treat right out of the food processor. Flax seeds are a great source of omega 3, similar to that found in fish such as salmon. Many studies have shown flax seeds lower total cholesterol and LDL cholesterol levels. Flax seed may also help lower blood triglyceride and blood pressure and reduce the chance of a heart attack. Flax seed is rich in fiber and the antioxidant lignan, known to fight disease and prevent cancer, especially breast cancer. Flax is also very good for relief from arthritis. 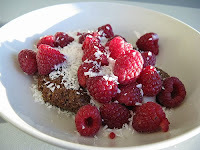 Put flax meal, coconut oil, agave, salt and water in a large bowl and mix well. Form 8 balls and flatten into a “pancake” shape, about ¼ to ½ inch thick. Place on a plate separated by parchment paper and chill in the refrigerator. Cover extras with saran wrap or place in a zip lock bag. 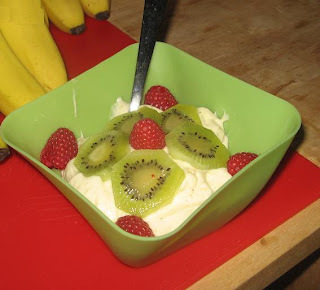 To serve, top with sliced fruit like bananas and strawberries and drizzle with raw honey. Place all dressing ingredients in a blender or food processor and blend until smooth. Place in a glass jar in the refrigerator for up to a week. Place all ingredients in the food processor and chop to desired consistency. You might like it a little chunky or completely smooth. Taste and adjust flavors to your liking. Serve on a bed of romaine lettuce and top with sliced grape tomatoes or use as filling for a lettuce wrap sandwich with cucumber slices. If you prefer a more traditional tuna salad recipe you can fold into the mixture a few tablespoonfuls of homemade vegan mayonnaise. Place all ingredients in a heavy duty blender except olive oil. Puree the ingredients until very smooth. With blender still in motion, slowly pour a thin stream of olive oil through the opening in your blender’s cover. Continue to puree until you reach the right consistency. Taste and adjust flavors to your liking. I have tried a bunch of different taco meat recipes and this one is by far the best! Process walnuts, garlic, cumin and chili powder in food processor until desired consistency; leave it a little crumbly like taco meat. Add a sprinkle of sea salt, squirt of lime juice and Tabasco if using and pulse a few times to incorporate. 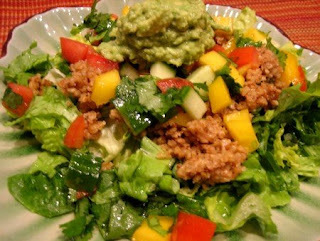 Serve rolled in a large lettuce leaf or on a bed of torn romaine lettuce with chopped tomatoes, raw olives, fresh corn salsa and diced avocado. Combine all ingredients and serve over tacos, or spoon into an avocado half. Put cashews, sea salt and garlic in food processor and mix until finely chopped. Add the rest of the ingredients and process until smooth. 1 TB Nama Shoyu (unpasteurized soy sauce) and 2 TB lemon juice. Seal the bag, swish the contents and let marinate approx 20 minutes. Drain and they’re ready to use in whatever dish you want. Make wide noodles out of the zucchini by drawing the vegetable peeler down the sides of the zucchini to create long “ribbons”. Keep rotating the zucchini as you peel, until you get to the seeds. Place a handful of noodles onto a plate, top with ¼ cup alfredo sauce and sprinkle the rest of veggies, herbs and lemon zest over the top. Very pretty dish and yummy! 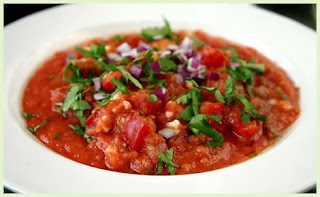 Blend all of the sauce ingredients except sundried tomatoes in a food processor. Add the soaked sundried tomatoes last, a few at a time and blend. 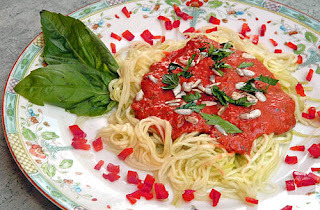 This sauce is great over zucchini pasta or on raw pizza! Place almonds in food processor and mix until fine. Add the rest of the ingredients and process until smooth. Lay out a nori sheet and spread with dry spinach or romaine lettuce leaves on the end closest to you. Top with ¼ C ginger almond pate and any of the other ingredients you like. 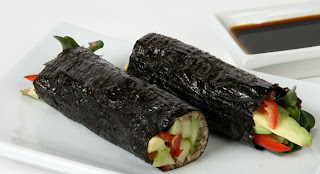 Roll tightly and serve whole or cut in half so you can see all the pretty fillings. Eat immediately so the nori is still crisp. I got this recipe second-hand, but it is from the book “Rainbow Green” by Dr. Gabriel Cousens. Using a food processor to make it quicker, individually chop carrots, celery and red pepper into very small (but not mush) pieces, taking each veggie out before chopping the next and placing them in a large bowl. Add onion, corn, olive oil and salt. Stir together. If you have a dehydrator, place this mixture in at 105 – 110 degrees for an hour. Mix this with the veggies above and put it back in the dehydrator for one more hour. If you don’t have a dehydrator, just mix it all up and enjoy a hearty meal! This makes a lot, share it or freeze some for next week. In a large bowl combine all the ingredients and stir well to combine. Using a small ice-cream scoop, your hands or a tablespoon, spoon rounds of the dough onto a dehydrator screen. Dehydrate at 115 degrees for 12-24 hours until crisp on the outside and nice and chewy on the inside. 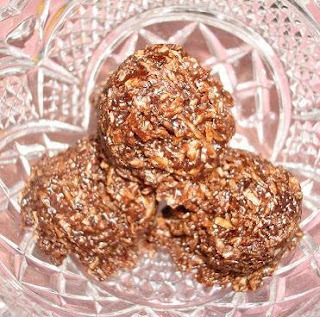 If you don’t have a dehydrator – just refrigerate them and eat them like no-bake cookies, they are delicious! Break up the frozen banana and place along with frozen papaya pieces in food processor. Turn it on and hold it down! The frozen chunks can really get the food processor moving around for a minute. When it starts getting mixed together, stop the food processor and scrape the sides down. Process until you see it becoming creamy and holding together (about a minute or two). Done! So creamy, just like soft serve ice cream but completely good for you. If you want, you can top with chopped nuts, coconut and raw cacao nibs. Alternate flavors can be created by using different frozen fruits in place of the papaya, such as strawberries. For chocolate, add raw cacao or carob powder to the mixture when you scrape the sides down, then finish processing. Make sure to choose perfectly ripe mangoes, and try to get mangoes with less fibrous flesh if possible. If using the 1/2 vanilla bean for the syrup, scrape the seeds out. Process the second 3/4 cup dates with the oil, vanilla seeds (or vanilla extract), and water as needed to make a thick syrup. Set aside. 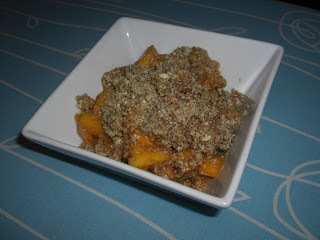 To make the filling, place the sliced mango into a large mixing bowl. Toss with the syrup. Spoon onto the cobbler crust. To serve, top with the remaining half of the crust. 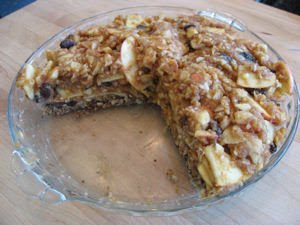 Note: This dish will keep for two days in the fridge but is best eaten right away while the crust is fresh and crumbly. After it is covered in the fridge the moisture makes the crust squishy. Blend the raisins in the food processor. Add oil and coconut, mix. Add cacao and agave and finish mixing. Shape into small bars and add a whole almond on top. You can eat them right away, but they are better if you can wait and refrigerate them for 30 minutes or more. Very yummy treat! Put pumpkin and sunflower seeds in food processor and mix until chopped. Add the rest of the ingredients and mix thoroughly. 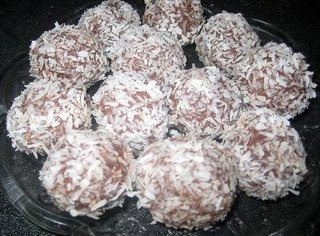 Shape into balls and roll in coconut. Chill until firm. Great little energy orbs! Most people want to know what my DAILY MEALS are like so I’ll give you a few ideas. Breakfast – Green smoothies are the best. Try them! It’s a fruit smoothie with a little added spinach, kale, parsley, celery or whatever you like thrown in for tons of nutrition. The fruit/green combinations are endless. 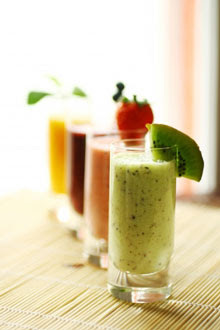 The very best book of recipes for smoothies is by Revvell Revati at this link: http://revvellations.com/shopping/index.php?main_page=product_info&products_id=3 you can even buy it as an ebook and download it right onto your computer immediately. 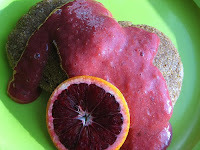 Also, check out the youtube video demonstration of green smoothies I have put on this blog. For another easy breakfast I will cut up a few fruits for a simple fruit salad like banana, apple, papaya, pineapple. Or, sometimes I want something a little more traditional or special and I will have one of Ani Phyo’s coconut pancakes with strawberries and raw honey drizzled over. 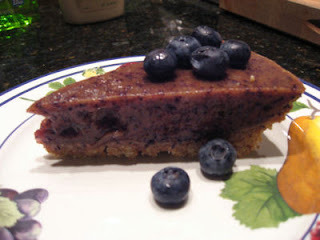 If I have made one of the delicious raw pies, I’ll have a piece of blueberry or banana cream pie – yum! Lunch – I might have half of the green smoothie I couldn’t finish from breakfast (It makes a lot), or a greens and fruits salad. I like to put strawberries, apple slices, grapes or other fruit in my green salad so that I don’t really need to use salad dressings. Plus I add raisins, pumpkin seeds, cucumbers, tomatoes, grated carrot, avocado, bell peppers, sprouts, mint leaves, green onion… just whatever I have on hand. 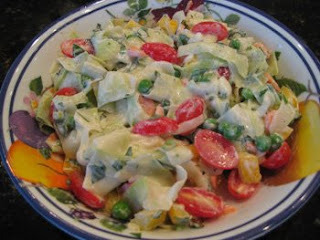 There are lots of great raw salad dressing recipes, too. I have also discovered a great “tuna” salad recipe I call Sunflower Salad that I love to roll into a lettuce wrap or put on a salad. Dinner – I like to try new recipes if I have time, but on nights where it has to be quick I will have green/fruit salad or veggie sandwich with tomatoes, cucumber, sprouts, spinach, red bell pepper and mustard sauce wrapped in big lettuce leaves or on dehydrated bread. I also love ants-on-a-log with celery and raisins using raw almond butter (sadly, peanuts aren’t raw). Some of my other favorite recipes are: tacos or taco salad made with ground seasoned walnut meat topped with fresh salsa, zucchini pasta primavera, veggie nori rolls, Thai spring rolls w/ “peanut” sauce and fresh veggie chili. Snacks – Trail mix made with raw nuts (almonds, cashews, macadamia, and pecans), pumpkin seeds, raisins, goji berries, dried banana slices and sunflower seeds. Fresh fruit or veggies of any kind. Something great to keep in your purse or desk drawer for a hunger emergency are Lara Bars, which are packaged raw energy bars (I buy at Down to Earth health food store). My favorite flavors are chocolate coconut chew, cinnamon roll, banana cookie, ginger snap and cherry pie. Treats – My favorites so far are chocolate coconut macaroons (Raw Food Real World by Matthew Kenney & Sarma Melngallis), blueberry pie (Living on Live Food by Alissa Cohen), banana cream pie (an Ann Wigmore recipe in Living on Live Food by Alissa Cohen), rawlmond joy candies (web recipe), banana-papaya ice cream (web recipe), fresh mango cobbler (Ani’s Raw Food Kitchen by Ani Phyo), raw truffles (web recipe). You’ll have your own favorites in no time! One question I am always asked is, “Where do you get your protein?” First, it is interesting to know that human breast milk is 5% protein. This is the perfect food for babies who are growing more quickly than at any other time in their lives (they are doubling their weight in 180 days!). Since older children and adults are not growing at such a rate, we do not need any more protein than that. The United Nation’s World Health Organization recommends that men and women obtain 5% of their calories as protein. The USDA puts this figure at 6.5%. Our need for protein is easily met with fruits having 4 – 9%, nuts/seeds/sprouts 10 – 25% and vegetables 15 – 50% of their calories from protein. How about calcium? Plenty of calcium is found and more easily absorbed into your body from plant foods. In fact, only 30% of the calcium in a cup of milk is actually absorbed by the body. Your body would get twice as much calcium from a cup of broccoli. The problem is that the body uses a lot of calcium in the process of excreting all the excess animal protein and will leach it out of your bones if necessary to get the job done. Plant protein doesn’t create that kind of problem. Plus, there is more calcium in many fresh green vegetables, fruits and nuts than there is in milk. Almonds have 245 mg, figs 269 mg, broccoli 123 mg and milk has only 115 mg/100g. Let me just tell you that I started by having raw breakfast and lunch, then eating a cooked vegan dinner for a couple of months and it was O.K. for a transition. I felt a little better, lost a little weight, got used to how it felt to be satisfied after a raw meal, but it was hard sticking to it! When I decided to get on board 100% it was so much easier to resist cooked food – I didn’t even want it. Cooked food smells good to me, but it is like smelling flowers, I enjoy taking nice big sniffs but I don’t want to eat them. And then the weight just started falling off. It was amazing to me! I also exercise most days. You will want to, too and your body needs it! Aerobic exercise gets your energy up, your mood happy and keeps everything moving through your body, plus it keeps that weight coming off if you need it to. Add weights to firm, tone up and make your bones strong to avoid osteoporosis. No kidding! You will experience great physical and mental changes. It is an adjustment getting used to cold food and you need to change your attitude about how “full” you need to feel all the time or what a meal consists of. But feeling a clean and energetic body is a great payoff for the small sacrifices you will make. So, now that you know my story I’m sure you are excited to get on with yours. I have been vegan (I don’t eat animals or animal products like milk, eggs or cheese) since 2003.